Time for our last challenge of 2017 at Time Out Challenge. It has been a year of fun for us and we hope you have enjoyed our challenges. 2018 rings in a few changes for our challenges-watch this space! Had to finish the year using my fav colour of purple! I like how bold this card turned out. So how will you interpret 'New Beginnings'? Check out here what our Design Team have made to inspire you. Our Guest Designer for this challenge is the very talented Patty. Her blog PJ's Projects is full of creative and inspiring projects, we are delighted Patty is joining us for this challenge. Enjoy our last challenge this year-I can't wait to see what you create. Oh I love those numbers. They are fabulous - and of course the purple is perfection. Love the movement the ombre colors provide too. Amazing! beautifully done! Happy New Year to you!! 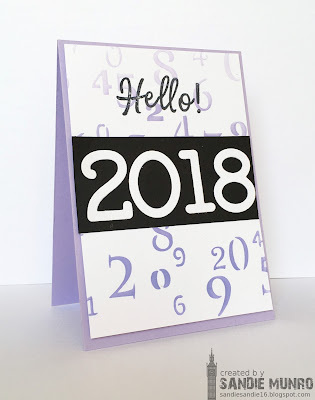 Fantastic use of numbers Sandie~love this graphic look! What a fun way to celebrate the new year. Love how your numbers are flying around in the background. I love how you used the numbers in the background too. Fabulous job. What a fun and graphic card. I love the design.